Check out these umbrellas with lightsaber handles and fully-lit shafts, stealing Star Wars juju with reckless abandon. 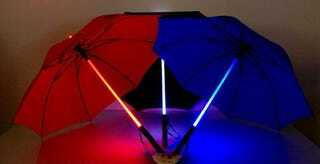 Pick out your choice of red, blue, or black canopies, and light up the night with that red, white or blue lightsaber look. Walk in a bad neighborhood with one of these lit-up umbrellas along with some white iPod earbuds, and you might as well just hang a neon "mug me" sign around your neck. But worry not. If somebody does steal this umbrella from you, you're only out 41 bucks, anyway.